Just because there is a USB port doesn’t mean it will support any USB device: it needs the necessary drivers for the OS to communicate with the USB device. For instance, there is no mouse support yet (but is supposed to come soon with an over-the-air upgrade). It seems some people are working to get a 3G USB dongle to work with some success but it doesn’t look like something for a regular user. But it is not lighter than the iPad 2 which according to Apple specs is 1.33pounds (601g) for the Wi-Fi only model and 1.35 pounds (613g) for Wi-Fi+3G model. The Acer Iconia A500 is “0.4 pounds heavier than the iPad 2” according to Laptopmag.com while Gigaom reports the weight to be 1.69 pounds and Carrypad reports: 765g. All 3 different sources say that it is heavier. While it does not support extra codecs, the standard H264 in MP4 format, AAC, MP3 should all work fine and they are the typical formats available: similar to the iPad 2. Otherwise software decoding could be used though players like RockPlayer Lite to play files that is not initially supported. Currently 720p output is available with 1080p output to come in the future. Perfect to load up the Complete version, let it load and have the entire newspaper right in front of you to start off your day. Update (19/Nov/09): Seems that Brunei Time is blocking direct image loading. 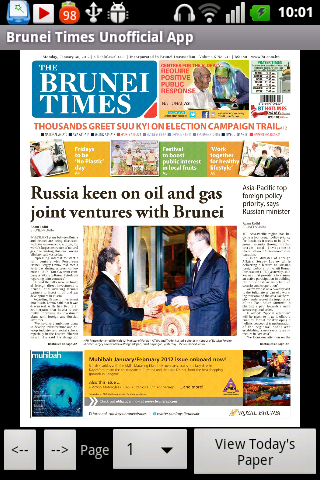 While a fix is being worked on, use Brunei Times E-Paper Downloader to get the news.